Accommmodation in Kleinmond: Herd’s Cove Bed and Breakfast. You are here: Home / Western Cape / Kleinmond / Accommmodation in Kleinmond: Herd’s Cove Bed and Breakfast. Herd’s Cove borders on the coastal nature Reserve which forms part of the Kogelberg Biosphere. Kleinmond nestles between the mountain and the sea we offer superb unobscured sea and as well as mountain views. There are two large luxuriously furnished guest rooms. These share a comfortable lounge that leads on to a sea facing deck. Both bedrooms have all the amenities to ensure the comfort of the guests. One of the bedrooms has an en suite bathroom with a shower only while the other bedroom has an antique bath in the bedroom with separate basin and toilet facility. Both rooms have tea and coffee making facilities. The lounge offers the quests the opportunity to relax in comfort and we offer full Premium DSTV. Kleinmond, just over an hours drive from Cape Town along the spectacular seaside Clarence Drive is in the heart of the fynbos kingdom. There are numerous hiking trails in the mountain area as well as along the shore. Of special interest are the wild horses that are found in the wetland area along the lagoon. Canoes can be hired for a trip along the lagoon where one may encounter the horses. Places of interest close to Kleinmond include the beautiful Harold Porter Botanical Gardens and the Stony Point Penguin Colony. Kleinmond is a charrming but functional little town. There are all the necessary amenities as well as some beautiful beaches. The quaint harbour area has a number of interesting little shops as well as a variety of restaurants. From the Herd’s Cove deck one can watch the Southern Right Whales and the area is renowned for some of the best land-based whale watching views. For the golfer there are two alternatives. The highly rated Arabella, is well known for the Nelson Mandela Golf Tournament. The Kleinmond Golf Course is beautifully situated and also well rated amongst South African 9-hole courses. Kleinmond is ideally situated to enable one to explore all the charms of the whole Overberg area. 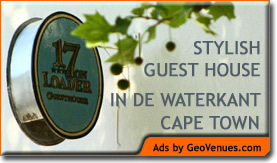 For guest house accommodation in Cape Town, stay at 17 on Loader, situated in the historic de Waterkant Village.